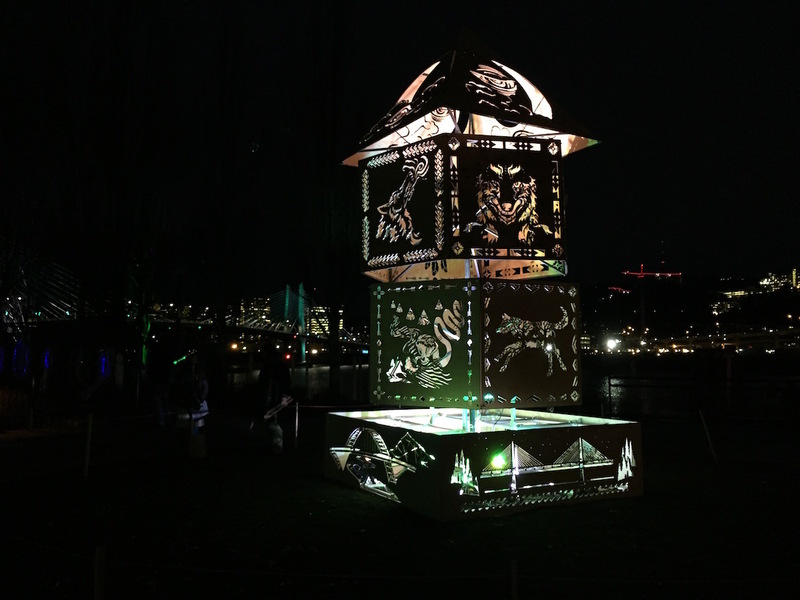 Portland winters can seem long and dark, and the Winter Light Festival is a perfect antidote. Best of all, it’s FREE! 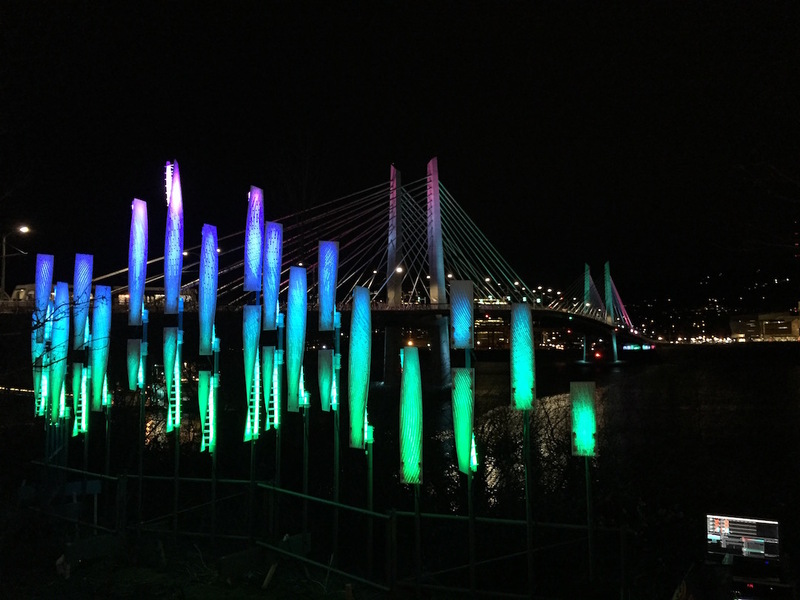 A couple of years ago I heard about the Portland Winter Light Festival, powered by PGE Renewable Energy, and it sounded interesting, but I wasn’t really sure what it was, and my schedule was busy, so I didn’t plan to go. And then, as I was coming over the bridge from downtown late one evening, I saw all these gorgeous, brightly colored lights down by OMSI. I realized it was the Winter Light Festival, and it was open for another half hour, so I changed up my plans and stopped by. I’m so glad I got to go, even if only for a little bit, because the lights were gorgeous and interesting and zany and so delightful on a cold winter evening. Last year we were lucky enough to be invited on a blogger tour of the festival, and it had expanded even from the year before. 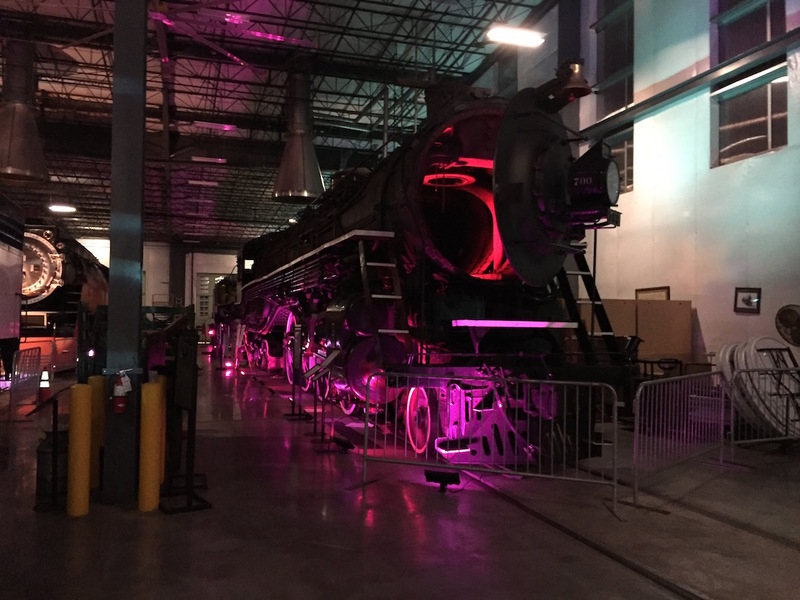 This year, they’ll continue the expansion, adding events in new parts of the city up near PSU, downtown at the World Trade Center, and even over at the Convention Center. Online, you can find schedules of all the action (including venues) and some sample trip planners to help you get the most out of the event AND you can see more descriptions of all the events, find maps, read bios of the artists, etc. in their online digital catalog which is outstanding. 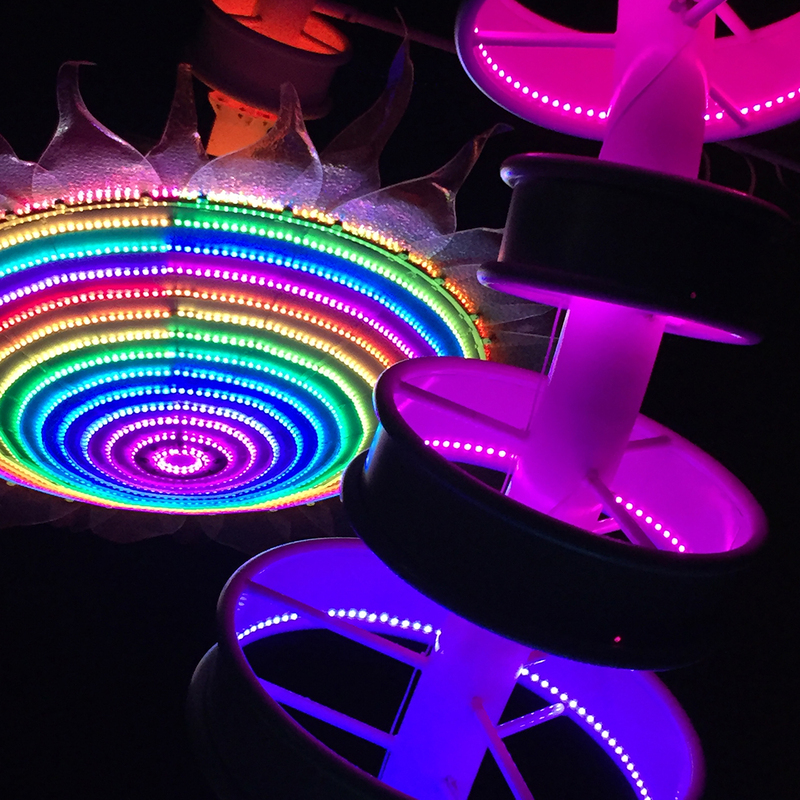 The Portland Spirit and Columbia Sternwheeler boats will also be illuminated this year and will provide free, easy transportation from the downtown Salmon Springs dock to the Eastbank Esplanade at Caruthers Landing. The Portland Opera, the Ukeladies, and Mysti Krewe of Nimbus will be performing on many rides. I’m very tempted to just ride back and forth! The Portland Streetcar will also offer free rides after 5PM. Use promo code: LIGHTS18), there’s a bring your own lantern parade on Saturday evening (fun for the whole family), there will be free “light science” talks from a bunch of smart, interesting folks throughout the event, Stories Around the Fire at Oregon Rail, and lots of drum performances, stilts, glow shows — all kinds of fun things happening. Check out the events list HERE! The festival runs Thursday night through Saturday night, February 1-3, 2018, beginning at 6:00 each evening — and it’s a great family event or date night. No tickets are needed for this outdoor event — simply bundle up, show up and enjoy the show! The creativity and talent of the people who plan, put on this show is, dare I say, brilliant. I hope you get a chance to check it out. Enjoy urban art, whether it’s during a week or a weekend, wherever you are!